Photos provided by Mani Neumeier. There are few - if any - other German Rock Bands that stand for all aspects of the broad scope of German Progressive Rock of the Sixties and Seventies that consisted of heavy Rock, experimentalism regarding drugs, music and sexuality and a left wing political attitude as is true for Guru Guru. Guru Guru always considered themselves as a part of the students' protest movement, lived together as a commune, and felt that the mere existence of their kind of music was a political statement in itself. Neumeier started his recording carreer as early as 1966 as the drummer of the Swiss based Irene Schweizer Trio. Free Jazz was one musical starting point for him, followed by an orientation towards eastern music ("Jazz meets India" was the title of a performance with Irene Schweizer at the Donaueschingen Music Festival in 1967), classic Jazz, ethnic drumming and, of course, the Rock Music of the late Sixties and early Seventies, leading to the fact, that Guru Guru was referred to as the German "Cream", a title of honor first attributed by others but later kindly accepted by Mani and the band... Which band? There were quite a lot of completely different bands called Guru Guru and there were frequent changes of the line up. This was in general typical for German Rock Bands of that time, but Guru Guru seemingly set the record with 26 changes in 33 years. The continuous "mastermind" behind all these different projects under one name was Mani Neumeier. Besides his musical abilities, his personality is spiced up with whit and humor, mostly of a kind nature, but sometimes bizarre and deconstructive. This flows into the performances in general - Guru Guru shows represent "action music" (in analogy to "action painting"), intellectually transformed aggressiveness, colorful phantasies and reflections on human nature, including the amphibic origin of all higher species, as in the famous "Elektrolurch" and the "Terra Amphibia" project. Guru Guru exists as a band up to this day, to be seen on stage at the annual "Finkenbach Festival" near Heidelberg, Germany, organized by Neumeier and on other rare occasions, as the band members now live in different parts of Europe, every now and then holding reunions for rehearsals, recordings and concerts. Besides this Mani Neumeier worked and works in a great number of other projects, among them free improvisations with guitarist Luigi Archetti performing as "Tiere der Nacht" (i.e., "nightly animals"), most recently recording and performing with the New Music composer and inventor of new musical instuments Hans-Carsten Raecke and working together in a Dance-Trance-Goa-Techno-Rock project called "Lover 303" with German female guitarist and drum machine programmer Conni Maly. But it is Japan, where Mani Neumeier is far more famous than in Germany or the US. Guru Guru and others of Mani's recordings still sell best in Japan and his statue is to be seen in the Tokyo Wax Museum among celebrities of the world. The day Mani and I met to make the appointment for the interview to follow below, he had returned from a successful two weeks' solo tour in Japan that led him to ten different cities. Up to now Mani recorded or contributed to more than 60 longplayers and compact discs, one for each year of his life. 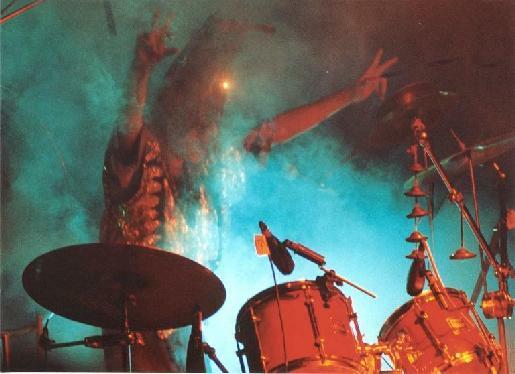 He is now 61 years old, still wildly drumming and with no plans for retirement in the near future. Frank Gingeleit (FG): Since your life with music is much more than Guru Guru, let's start where it all began. What were your first steps into the music business, what was your musical education like, and who were the examples you followed? Mani Neumeier (MN): I started gigging as an amateur musician as early as 1959 in a couple of amateur bands in Switzerland. We started with Dixieland, Swing and Modern Jazz as at that time there was no Beat Music or Rock'n'Roll in Continental Europe. In Zurich, where I lived at that time you had much better opportunities to get the "new" records from England and the United States than in Germany. And it was also Zurich where I happened to see Louis Armstrong, Lionel Hampton, John Coltrane, Art Blakey, Miles Davis, Theoloniuos Monk, Max Roach... To see them live on stage were the greatest moments in my life, and they were my "teachers". I never reached their class, but I'm still striving to get closer to it and maybe I will some day. As a professional musician I started as a member of the Irene Schweizer Trio and the Globe Unity Orchestra together with Jacky Liebezeit. We took everything apart that we could find and put it back together in a new and fresh way. There were recordings produced by Joachim E. Behrend (later also well known as an author of books on Jazz - F. G.) and we were on stage at the Donaueschingen Music Festival and at the Berlin Jazz Festival in 1966. I discovered and developed my own style of drumming. Maybe I might be called the first European Free Jazz drummer. But, anyway, I already had a "name in music" before the Guru Guru thing started. I had a few lessons at the "Basel Drum School" - all sorts of percussion instruments - and many years later I took lessons to play an Indian Drum called Tavil. My teacher, an Indian master of the drums, was Paramashivam Pillai, but I've already been in the music business for about twenty years then. FG: Let's focus on Guru Guru. It seems that this was quite a leap from what you had been doing before. FG: So the Guru Guru band project also was some kind of a sociological experiment? MN: Yes, we were a commune, a part of the Underground Movement. All our time was exclusively devoted to the group and the music. From 1968 to 1971 we did not even have a permanent residence. We lived in a bus like nomads. Every now and then we lived at the homes of friends, fans and other bands. From 1971 to 1976 we lived in a house in Langenthal and in 1976 we found our home in Finkenbach. We lived there as a band together with our girlfriends and our tour crew. It was a project that worked quite well and it was even more than a project, rather a clan, a family. (Since 1981 the home in Finkenbach serves Mani Neumeier as his personal "summer residence" - FG) We wanted to change the whole society. We lived "socialism". Everybody had to put in as much as he took out. We shared everything and everybody was equal. FG: A word about your economical situation at that time? MN: In the beginning there were certain restrictions and limitations - for a little while we lived on jelly sandwiches and joints, but we never starved or suffered from severe poverty. 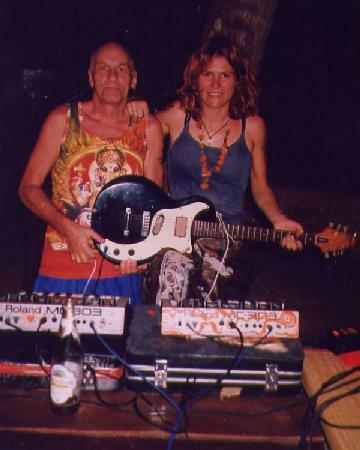 At that time not all of the 22 Guru Guru longplayers had been released, but we sold records, played many concerts, appeared in movies, had more than one hundred radio and TV shows and were featured on the front pages of several German music magazines. FG: This was in the beginning, and then? MN: Guru Guru sold more than half a million copies of more than twenty record releases, not of one album, as the music industry might have preferred. We went through twenty different managers, were ripped off by almost all of them and later it was me who did the job with the bookings. We successfully toured abroad, in Continental Europe, in the United States and in Japan. After the shows people came with piles of records to be autographed. FG: Let's return to Guru Guru in the political climate of the late Sixties and early Seventies. Looking back: Was it only a personal experience of the band members and the people who lived with them, or was there more? MN: Our music at that time was a political statement in itself. We were part of a scene together with other bands with political attitudes like ours. We were left wing but no members of a political party. The sessions we had with other bands or some of their members - Amon D��l, Can, Xhol Caravan, Kraan - had a touch of conspiracy. The musical output was completely new. Most of the tunes, like our LSD Marsch for instance, had nothing to do with the British or American examples of that time. We played concerts with a left wing student union called SDS, where political statements were read between our tunes. In the city of Heidelberg in the Neckar valley, we managed to put on a daytime show on a hillside facing the famous Heidelberg Castle where the whole city was forced to listen. When the police showed up to end the concert, we had already split. To us left wing political attitudes meant openmindedness, toward the whole world and foreign customs, cultures and attitudes. In 1974 a group of Shoshonees lived with us for a while and our concerts at that time were demonstrations meant to draw the attention to the political and social situation of the Native Americans. All this was quite provocative at that time. Another example: we were one of the first bands in Germany wearing long hair. We were bad mouthed in the streets and we were not served in restaurants. But we wanted these effects of shock and provocation. FG: But provocation was also a programmatic part of your regular shows? MN: Yes, our concerts did not only mean to present music. The intention was total artwork. Besides all other intentions there was also an element of slapstick and play acting. The name Guru Guru itself was a joke in the direction of the Beatles - they had their personal Gurus in the late Sixties. In some songs we used animal sounds instead of vocals. 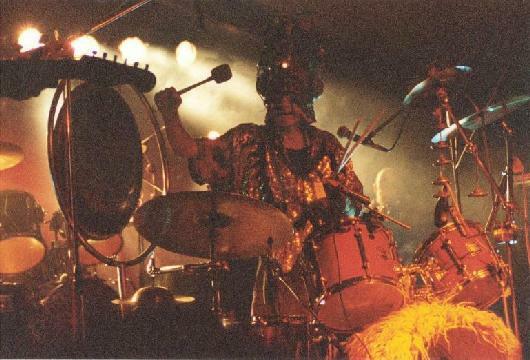 We were the first Rock Band that had put on masks during a concert (as the Elektrolurch Mask - see photo, F. G.), we had chickens on stage during the Chicken Song (sings "Set your chicken free") and other provocative actions. In the beginning we sometimes took LSD just before a concert began and then we were waiting for what might happen on stage. - It was only about three years ago that I learned that in Japanese Guru Guru means "rotating", I didn't know this before. 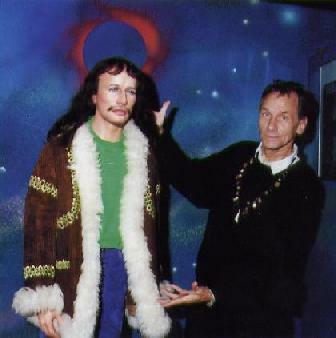 Did you know that they put a statue of me in the Tokyo Wax Museum, right next to celebrities of the world? FG: Besides Guru Guru your career was full of other projects. MN: The main side projects are Tiere der Nacht, Terra Amphibia and Lover 303. Tiere der Nacht is improvisational free music. Not only Free Jazz, but also other musical elements. It's a conversation between Luigi Archetti and me. I tried this concept also in full band performances, but this soon turned out to become too dense. With only two performers it has an air of minimalism. I love it. To work like this means full freedom, it's a gift, but it takes years of experince to achieve this. The latest project is Lover 303. I really hate Techno, but I used to play along with drum machines and sequencers long before there was Techno. Conni Maly, my partner in this project, uses electronic devices and a guitar. She has a good feeling for rhythms, and I am forced to play in a way completely different to how I usually play, mainly counterbeats. This way Techno gets a warmer texture and it appears to become more "human". This project is also a bridge between generations. Conni is about half as old as I am, a "networked post hippie girl". We also play Goa Shows in rural areas and so Techno reaches the villages. And I'm also involved in Contemporary Music projects. There's a great diversity in all of these projects. One outstanding project was of course "Meet the Demons of Bali" together with Peter Hollinger and sixteen native drummers from Bali. And there is the Mani Neumeier "One Man Show", quite frequently seen on stage. FG: Other well known music performers using provocation as a part of their concerts, as Alice Cooper or Ozzy Osbourne for example, always claim that this is merely a part of their shows and has nothing to do with them personally. What do you think about yourself in this respect? MN: For me it's not only show. My message is love and trance and do your own thing. For me it means more than an element of my shows. "Love" is the word that describes it most precisely - and simply. In the beginning of Guru Guru provocation was a goal in itself. Now I want to make people happy. And I think I can achieve this. People have a better state of mind after a concert than they had before. But on the other hand I'm not quite sure that it's me who's doing it. Maybe it's something cosmic that goes through me and reaches the people. FG: This last statement might have been a good end for an interview with a Space Rock Magazine. But readers might also be interested to know how it will go on. What are your plans for the future? MN: There will be a documentary CD of the live performances during my "Sixtieth Birthday Anniversary Tour", where I performed with Luigi Archetti, Conni Maly, Hans Reffert and former and present members of Guru Guru. And there will be a new Guru Guru CD before this year ends. 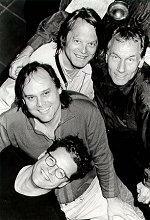 The current Guru Guru line up is: Roland Schaeffer, Peter Kuehmstedt, Luigi Archetti and me. Hans Reffert joins us every now and then. And I will go on tour again. I want to perform as long as I can make people feel happy.